Outside of what is written in the Bible or what we are taught in Sunday school (or any faith-based school for that matter) or is preached in church, Jesus’ life is pretty much an open book, one upon which artists as diverse as novelists Nikos Kazantzakis and José Saramago, filmmakers like George Stevens, Martin Scorsese and Mel Gibson, and the countless painters and sculptors who have portrayed it in canvasses, wood and stone project their own vision. Rodrigo García adds his voice to this multi-ethnic chorus with Last Days in the Desert, his original, canon-ignoring take on the 40 days Jesus spent on the desert meditating, fasting and facing the Devil’s taunts and temptations. Last Days in the Desert is García’s first male-centric film after such women-led dramas as Things You Can tell by Looking at Her (2000) and Albert Nobbs (2011). It is also his most personal, as he explores themes closer to his heart such as the creative process and father-son relationships (García is Gabriel García Márquez’s older son). Identified as Yeshua and Rabbi in the film, Jesus (Ewan McGregor) is nearing the end of his desert pilgrimage, trying to come to terms with his eventual destiny and role as the Son of God. “Father, where are you?,” he asks. “Father, speak to me,” he pleads to no avail, the desert’s calm, oppressive silence his only answer. Assuming Yeshua’s guise as if he were a mirror image of the future Messiah, Satan (McGregor) has been dogging him every step of the way. 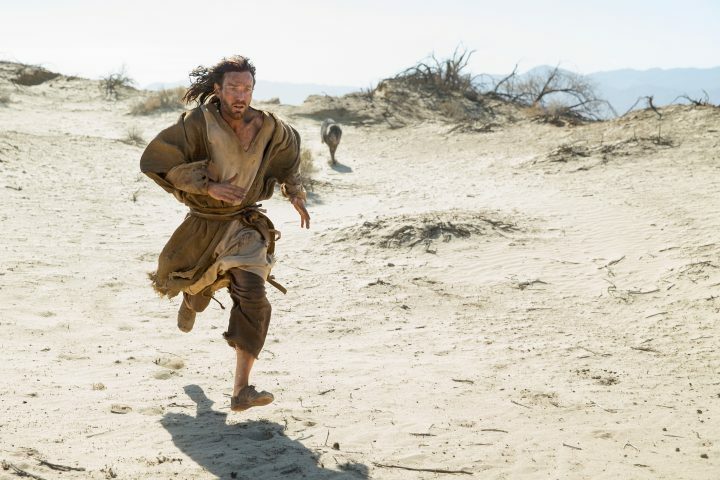 As he makes his way to Jerusalem, Yeshua encounters a family living alone in the desert: a 16-year-old boy (Tye Sheridan), his 60-something father (Ciaran Hinds) and their ailing mother and wife (Ayelet Zurer). The father is building a stone structure for his son in the hopes that he will carry on with his carpentry business in the desert. The son wants to strike out on his own and see the world, and asks Yeshua to take him to Jerusalem. The mother sides with her son’s wishes. Yeshua decides to delay his journey and offers his help to the family in exchange for shelter and food. Satan, though, has other plans: he shares with Yeshua a vision of the future that this family might have faced had he not crossed their paths and challenges Yeshua to keep the events from happening. Don’t expect any major dramatic fireworks from this plot point. While other filmmakers might have turned this challenge into another fight between good and evil, with some speechifying and digital effects thrown in for good measure, García opts for a more understated, observational approach, one that relishes these characters’ daily routine as they cut stone, put it in place, eat, drink and talk while taking care of one of their own. Yeshua listens, watches, talks and, no pun intended, chips in. He sees in the devil’s challenge an opportunity to learn more about the human condition and on this father-son conflict a mirror image of his own relationship with a father figure who just happens to be God. Surprisingly, outside of the occasional taunt and temptation (in one scene he assumes the mother’s form to seduce Yeshua), Satan takes a hands-off approach. He watches Yeshua just as Yeshua observes this family. He briefly lets his guard down as he witnesses, in awe, a shooting star across the sky. He may be the Fallen One and he may resent the God that created and banished him in the same way that Sheridan’s son resents his father, but God’s creative power still enthralls him. At one point in the film, Satan tells Yeshua that, as creator, God has hit the reset button on his creation countless times, implying that he will do the same with Yeshua. God, in the eyes of the Devil, is the ultimate artist. And yet, the desert’s austere beauty, captured with a painter’s delicate touch by Emmanuel Lubezki’s camera, contradicts the devil’s assertion. No artist would go back to the drawing board after achieving such sublimeness. And therein lies Yeshua’s answer to his early question in the desert: God already speaks to him, through the desert, the family and the Devil himself. He speaks through his creation, just like any artist does. You just need to be in tune with that voice. We suspect that Jesus will eventually use this story unfolding right in front of his eyes as a parable. For not only does it address the dynamics of a father-son relationship but it also highlights the roles empathy, kindness and compassion should play in our lives. The end result of this family dynamic is inevitably tragic, and one that neither Yeshua nor his alter ego could have imagined. But tragedy also offers its own unique insights. García is thus delivering a far more spiritual, and human, film than many of the faith-based films that have hit the screen this past year. Casting McGregor as both saint and devil is a masterstroke. As Yeshua, McGregor delivers a restrained, patient and yet gripping performance; as the devil, he avoids the temptation of playing him as a cackling miscreant, turning him instead into a playful, naughty, resentful, sly creature that, in his taunts, delivers as much wisdom and perspective as the family, even when he doesn’t have neither Yeshua’s nor the family’s best interests at heart. The film is surprisingly simple and austere and it may task the patience of some members of the audience. And the final two sequences almost undermine García’s intent (frankly, I find the final two shots completely irrelevant and unnecessary). But stick with it and you will be rewarded not only by Lubezki’s photography, Danny Bensi’s and Saunder Jurriaan’s contemplative string score and pitch perfect cast, but by its overall humility. Last Days in the Desert is that rare film that invites contemplation, especially in a season filled with so much cinematic noise. In Chicago, Last Days in the Desert is showing exclusively at the AMC River East 21.